Week 1 of my first ever two week vacation is coming to end. I've spent the last eight days in the mountains of far western North Carolina : exploring rocky outcrops high up on the surrounding ridges, swimming at the base of waterfalls, watching birds nest, sitting quietly as storms roll in across the lake, hugging 400 year old trees, eating and drinking local deliciousness......oh, and training for my first half-iron triathlon! Technically, this week was Base 3, Week 1 in my annual training plan. However, the week can more accurately be described as Pure Enjoyment. Lots of hill running in a gorgeous setting supplemented by long and short day hikes, open water swimming almost every day (some for training purposes, some for only play! ), home yoga practice out on the deck overlooking the lake, and biking - on my trainer because the hills around here are little too beyond category for me! - to my heart's content. By the end of today, I'll have put in over 13 hours of training this week -- and have never felt better! Auld Lang Syne has been running through my head for the past couple of days. Yes, I realize that it's not officially time to celebrate the end of one year and the beginning of the next, but between transition week, the summer solstice, the time for reflection that vacation has offered, and the beginning of my half-iron training program, it sure feels like it to me. So in that new year spirit, I'm reflecting on my 2008 training thus far and recommiting to my goals for the year. In short, I'm very happy -- with my training, my physical and mental progress, and the balanced way in which I've been integrating training and racing into my life this year. I have a deeper appreciation for how progress works -- it's slow, it's baby-steps (forward and backward), it's not always linear, then it's a breakthrough, then it's slow, then it's baby-steps.... Perhaps most importantly, I'm having a lot of fun! Feels pretty great to realize that a tough 5K two years ago was 35 minutes and a tough 5K last weekend was 28! When I step up to the start line in November, I want to know that I have done everything I could to reach my goals. First, I'm recommitting to the work I need to do on fundraising front. I'm over half-way to raising $7,300 to support the programs and services Genesis Home provides for families moving out of homelessness and into independence. As we all face the current realities of higher fuel and food prices, organizations like Genesis Home often see decreases in charitable donations at the time when they need them most. Over the next few weeks, I'll be re-contacting folks who have previously expressed interest in Tri to End Homelessness and working on expanding our circle. - Passing this blog address on at least 5 other people and asking them to learn more. Second, I'm recommitting to giving my all during each workout. I want to wake up each day and be grateful for my body; for the opportunity to singularly focus on me when I'm on the bike, in the pool, and on the run; for the support I'm receiving from my family, my friends, and my coach. I want my training - even on the tough days- to be an expression of that gratitude. Giving my all during these next four months of training means committing to spending more time this summer swimming in open water, welcoming the track sessions I know await, and seeking out new ways to work on my overall strength. It's saying I LOVE CORE / HILL / FORCE WORK! - instead of dreaming up creative excuses for skipping /shortening / adapting it. Third, I'm recommitting to the nutrition and sleep needs that this type of training requires in order to produce results. It's a waste of the time my training takes from other aspects of my life and the support that others are providing, if I don't supplement all those yards and miles with the right fuel and sleep. Saying yes to early bedtimes only makes the early alarm clock easier to heed. Saying yes to whole, colorful, balanced food and the time it takes to prepare it - and no to the second helping of dessert or wine or chewy, chocolatey goodness sitting on the receptionist's desk in my office -- will only help me come November 1. Fourth, I'm recommitting to mental preparation. The more yoga I practice, the more intentionally I focus on my breath, the more time I spend sitting quietly and watching my thoughts pass by, the better prepared I am for my races - and more importantly, my life. Over the next four months, I will carve out time each day - even if it's only when I'm sitting in the car waiting for the light to change - for meditation. Those are my process goals for the remainder of my 2008 season. Yes, I have some time goals too for each of my upcoming races - and perhaps I'll share those in the weeks and months ahead -- but for now, I'm recommitting to the inputs and having faith in whatever outcomes those produce. Transition week is ending nicely. It's 9:54 a.m. on Day 2 of my two week vacation. I'm still in my PJs, drinking coffee, over-looking a serene mountain lake. Ryan has left the chaos of Genesis Home behind and we're both enjoying some much needed down time from work.....leaving much more time for play! This will be a transition week. Work out only as you like, and keep EVERY effort light and fun. There's certainly no need for weights this week; yoga, sure. Take a little time to reflect on the first half of the season and to think about just what you'd like to target as goals as you work toward B2B. In the spirit of reflection and recommitment, I've taken time each morning for seated meditation. I sit. I breathe. I notice when my mind tries to chatter away. I attempt to let the chatter float on by. I notice when it resists. And I breathe some more. Monday was glorious. I slept in. I read the entire paper and enjoyed two full cups of coffee with my husband. I sat for 10 minutes. I got to work a little early and was productive and then arrived at my evening yoga class completely relaxed. Tuesday was good and more of the same. I took an easy 30 minute run around my neighborhood - no heart rate monitor, iPod blaring -- and then sat for 15 minutes with a mind that was a bit more chatty than the day before. This morning, I woke up before my alarm at my usual "I have a crazy day and need to get my workout(s) in" early morning hour. Tossed and turned. Felt antsy. Puttered around the kitchen. Debated whether or not I should go to pool. Puttered around a bit more and pulled out my yoga mat. Practiced for a solid 30 minutes, resisting the desire to do anything that felt particularly physically challenging, and then sat for another 15 minutes. Oh, that felt good. I'm comfortable sitting now. Breathe. It's been a wonderful first half of the year. Saturday was so hard -- but so motivating. Breathe. What are my goals for the rest of the year? Do I need to do laundry tonight? Breathe. Breathe. Is that meeting today or tomorrow afternoon? Why did she say it THAT way? What did he mean when he said....? Breathe. Breathe. I'm going to lose endurance!! And speed!! What if I lose motivation? It's nice sleeping in. Wait - what if I gain weight!? I should have gone to the pool. Stop being silly. You KNOW better than this. Wait, wait, wait, no judgment, remember - just notice. Breathe. Breathe. Grrrrr..... Breathe. After a wonderful Friday night dinner with my family in Asheville, I tossed and turned a bit the night before the race and was wide awake before the alarm went off at 5 a.m. I generally become a classic, type-A triathlete on race morning and got to the race site with PLENTY of time to spare -- along with about 100 other classic, type-A, early-bird triathletes! Once I arrived on site, I was very calm. The location was beautiful, check-in went smoothly, I was assigned a good bike rack position, and I didn't even have to wait in line at the port-o-potty! All was right with the world. After setting up transition, my brother-in-law Dave (who was also racing) and I headed out to warm-up on our bikes. As we made our first turn on the bike course and began to climb, I thought, "Hmmmm......course description didn't say anything about a climb out of transition." Little did I know then that the words "Course description didn't say...." would be constantly in my head for the next two hours. After a quick bike and run, we got good luck hugs from family (where we realized that our camera had dead batteries...but you can see a full gallery HERE and pictures of Dave and me in this post are by Asheville Citizen Times Photographer Jon Fletcher), headed to the water, and got ready to roll. Perfect open water swimming conditions. 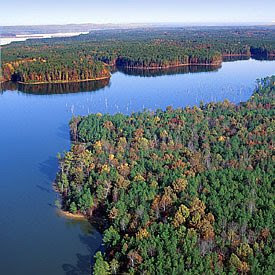 Clean, sandy bottom lake surrounded by a backdrop of the Blue Ridge Mountains and bright blue sky. Water temperature of 81 degrees, so no wetsuits allowed. Just as I had intended, I stepped right up to the front of my wave and took off when the horn sounded. No holding back on the swim this year! The start was very, very crowded and I took my fair share of bumps, kicks, and grabs -- and gave an unintentional few as well. Nevertheless, I remained very calm and simply focused on my breath, form, and sighting. The course consisted of three legs: Less than 250 yards to the first buoy, left turn, ~ 250 yards to the second buoy, left turn, ~300 yards to home. Overall, I was very pleased with this my first open water swim of 2008. I felt strong and I sighted very well on the first two legs, getting a wee bit off on the third. Given that I wasn't really winded when I came out of the water, I could have pushed harder, but overall a great day in the water for me -- and my fastest open water swim yet! A quick run on sand, grass, asphalt, and tennis court to my bike. Glasses, helmet (an aero helmet on loan from my coach -- a first for me), shoes, bike - GO! 59 seconds later I was riding. The 17.5 mile bike leg will be challenging, providing athletes with a steady mixture of climbing, descents and flat terrain. There are nice climbs at the 3 and 11 mile marks that will separate the field. This race may be a sprint, but if you do not regularly ride in the mountains, this very well may be the hardest bike ride you've ever done. Prepare yourself. The constant climbs are briefly interrupted with screaming descents where your breaks will squeal and you may question your ability to remain upright. You will not find a rhythm. Instead you will either be wishing you had a baby chain ring or maxed out on your big ring, hanging on for dear life. When you see the words SLOW DOWN NOW spray painted on the road, take heed. Practice your descending turns now, because on race day, if you do not find the right line, you will either lose all of your momentum and face another immediate, mentally exhausting climb without the right gearing -- or you will fly off of the road. And yes, there are serious climbs at miles 3 and 11 -- but you will be so tired by the time you reach them, that it won't even register that these are the climbs you thought you prepared for. Having said all of that, I am quite proud of the way I handled the bike. It WAS the hardest ride I've ever done. Even though it was not what I expected, I stayed mentally in the game and worked my mantras-- both when I was going 36 mph and when I was going 6 mph. I truly raced, playing cat and mouse with several gals in my age group for the first third of the ride before I got angry, said "Enough of this (insert the expletive of your choice)," put the hammer down, and left them for good -- on a hill. I was determined to have an average speed of at least 17 mph -- and just got it, averaging 17.2. I was SO happy to arrive at T2 -- diaphragm cramping, tight hamstrings, parched throat, mental exhaustion and all. 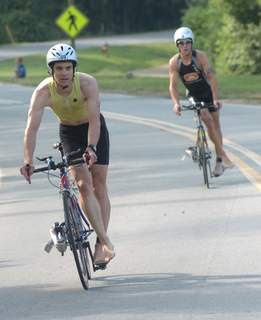 After coming out of the water 11th in my age group, I was ranked 6th at the end of the bike. I was there for 44 seconds. It was a blur. Here's a great picture of Dave approaching T2, textbook style. Coming out of T2, I grabbed a cup of water from the first aid station and threw it over my head in an attempt to clear the bike from my mind. Didn't work. Instead I spent the first mile obsessing about the bike and not focusing on the task at hand. By the time my head cleared somewhat and my legs came around, I hit the massive - as Dave called it "slap in your face"- hill at mile 1. It was demoralizing -- but I kept repeating "small steps, big arm, small steps, big arms" and sloooowwly made my way up. The rest of run was on beautiful trail around the lake -- and I had plenty of time to notice the scenery, as my legs just wouldn't work. I saw mile 2 and knew that I wanted to speed up. Unfortunately, no juice to be found. 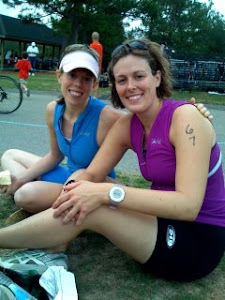 Instead, I thought about cadence and kept my head up as 4 gals in my age group passed me. Ugh. Rounding the last turn for home, Ray was waiting and said, "C'mon Rob, I want to see something!" I scowled, gritted my teeth, and powered the last 45 seconds to the finish line. Slowest 5K in a long, long while, but very happy to be done. I walked straight through the shoot, back into the lake and sat down. A real test in a beautiful setting. An improved swim. A strong bike. A tough day on the run. More muscular endurance work to do. More mental training, "clear the mechanism" attitude to cultivate. A fun day -- by the end! Oh, and a GREAT post-race lunch for athletes provided one of my old Asheville favorites! As part of preparation for Saturday's tri, my coach suggested that I visualize each part of the race and write my race report NOW. How do I want to feel before, during, and after? What technical and emotional pieces do I need to remember? Where will I struggle and how will I respond? I’m calm. I’m prepared and I know it. - Are you going as fast as you can right now? I set up transition. I tape a Hammer Gel to my bike tube. I note where my bike is racked in transition by counting the racks from the Swim Finish and Bike Finish. I warm-up: bike, run, swim. My bike is working smoothly. My legs feel springy. I feel buoyant and confidant in the open water. Wetsuit is on. I take a gel and some water. I repeat my mantras. I say a prayer of gratitude for the day, for my body, for the opportunity. 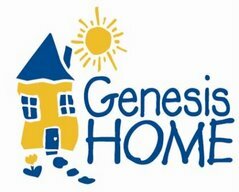 I think about the Genesis Home families. I breathe. The horn goes off and I do not hold back. I jump right in with the pack with the knowledge that I can maintain my breath and form regardless of where other people are around me. I remember the last two weeks of race pace workouts and I know that my goal pace actually feels a little faster than I think I can sustain. But I can sustain it. I have sustained it. Go! Find someone to draft off of. Hang on. Pull, pull, pull, breathe, sight, pull, pull, pull breathe, pull, pull, breathe, sight. Repeat. Smooth stroke entry, strong pull, light kick (let the wetsuit work). I am bumped, but it does not phase me. I have become a strong swimmer. Breath and form. I am focused. I reach the first buoy, turn left and find a quick, efficient rhythm. The yardage does not feel long because I have put in the training. I repeat this until I feel brush the shore with my fingergtips. Pop up and skip out of the water, high knees. While running to T1: goggles up, right hand undoes the wetsuit neck, left hand unzips wetsuit, right shoulder down, left shoulder down. I efficiently reach my bike. Swoosh! Down goes the wetsuit. Left leg out. Step on suit. Right leg out. Throw wetsuit to side. Sunglasses, helmet, shoes, bike, GO! 17.5 miles, one big loop. I come out of transition and quickly find my rhythm. I exhale deeply, get aero, focus on cadence, and work all of the hills - up and down. I’ve learned that the bike is a strength for me. When I reach a significant hill at mile 3, I repeat Trust Your Strength and go for it. At mile 5, I take my Hammer Gel with a small sip of water. I relax my grip on my aerobars and let go of any tension in my toes, feet, jaw. For how much of the ride can I stay in my big chain ring? If a racer in my age-group attempts to pass me, I follow (not too closely though, no drafting!). At mile 11, I reach another hill and remind myself that this is the last significant climb. Spin, spin, spin, spin, spin. I take in a little more water. I feel alive and fast and powerful. I efficiently ride through the last few miles, I don’t let up. If my mind wanders, I bring it back. I say FOCUS, I chant. When I see T2, I spin my legs out briefly as I approach the dismount line. Rack bike. Right shoe off. Left shoe off. Right running shoe on. Left running shoe on. Race belt, hat, GO! Put hat and belt on while running. Coming out of T2 should hurt. It has in every other race. But this time is different. I’m stronger and mentally prepared. My legs feel a little heavy, but I remind myself of the past few weeks’ workouts and know that I can still build speed. This will pass in less than 5 minutes. This will pass in less than 5 minutes. This will pass in less than 5 minutes. Trust your strength, trust your strength, trust your strength. At mile 1, I reach a hill into the adjacent neighborhood and think small steps, big arms, small steps, big arms. I remember the hill in my neighborhood that I’ve been running up at the start of my last few bricks and think: Piece of cake. I reach the half-way point and pick up speed. It’s flat. The terrain is the same as the Duke East Campus loop I run all of the time. I KNOW HOW TO RUN THIS. I reach mile 2 and lay it all out. I notice that my mind says slow down. Instead of slowing I let out my signature, audible grunt and I GO. I pump my arms, I remember my interval runs, and I know this will be over in just a few more minutes. Are you going as fast as you can RIGHT NOW? I see the finish line, notice the wave of nausea, and power across the line. I’ve just run my fastest triathlon 5K. Just over one year ago, I swam in open water for the first time. It was dark and choppy and panic-inducing. I had to focus all of my attention on simply exhaling so as not to hyperventilate. Thinking about form or sighting or speed was kind of out of the question. Yesterday, my sister and I enjoyed over 45 minutes of open water swimming at Jordan Lake. We practiced sighting, worked on form, and simulated race conditions, complete with kicking, grabbing, and a little unintentional scratching (thanks Ray!). I felt strong, speedy, ready for Saturday's race and pleased that not even a hint of panic entered into my consciousness. The swim gremlins are at rest. Hooray! If you're like me, you've been closely following the ongoing news of the recent natural disasters in China and Myanmar. You've been sending thoughts and prayers to our fellow humans on the other side of the globe. And perhaps, you've joined in with others from around the world and given more than $70 million dollars to U.S. charities aiding in the disaster relief efforts. Times like these -- September 11, the Tsunami, Katrina -- truly remind me of how small our globe really is, the connectedness of us all, and the many, many blessings I have in my own life. But while these enormous disasters thankfully happen infrequently, the families living at Genesis Home have confronted personal disasters on a regular basis: Choosing between groceries for the week and a tank full of gas needed to get to work, past due notices from the power company in heart of a dangerous summer heat wave, gambling on how long to wait before going to the doctor since health insurance is non-existent. Your contribution to Genesis Home helps ensure an end to these personal disasters that, while not covered on the nightly news, are just as real as the ones we hear about. Here in Tri to End Homelessness world, I've been living the good life for the past week: Super, peak workouts where I have that "this is gonna be a good one" feeling as soon as I start and can really see all of my Spring training coming together; an intense, but successful period of work during which I'm doing the part of my job I love the most; and enough time at home to get a few life maintenance items checked off my list. What more does a gal need? 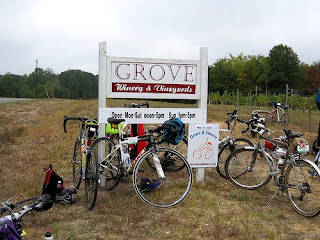 This past weekend, the good life continued as I participated in Gears & Cheers - a group ride and winery tour hosted by the Grove Winery & Vineyards. The 40 mile route took us through beautiful parts of Guilford and Rockingham counties, including a stop at the Chinquapin Plantation. I started the ride with my coach, her husband, and few other friends, and was then briefly on my own when the 40-mile group separated from the other riders. However, I love the camaraderie among cyclists and quickly joined a new group of folks who were going about my speed. Our group worked together in a paceline formation and I particularly concentrated on working the hills in preparation for my upcoming race. 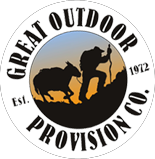 The company, the rest stop support, and the weather could not have been better! I finished the route in just over 2 hours and 20 minutes with an average speed of ~17 mph -- and quickly made my way to the lunch and wine tasting tents! The good life, indeed.